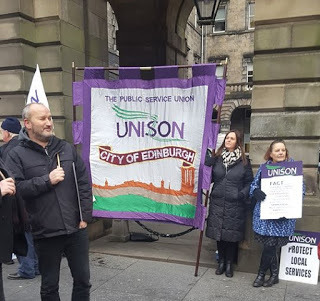 As we face yet another year of cuts, the trade unions have grave concerns about the impact that these cuts will have on Service provision and on our members Terms and Conditions. These continuous cuts will have a negative impact on the public of Edinburgh who rely on council services, in particular the poorest and most deprived, the most vulnerable children, young people and families, the elderly, the disabled and all who reside in the areas of greatest deprivation in our city. Through the current Transformation programme we are told time and time again that we need to become more lean and agile. What this means in practice is; work harder with less. Our members have and always will work hard to deliver the vital services they provide to the public. However, staff are reaching breaking point and are finding themselves overstretched and unable to access the resources that they need to carry out their work safely. Services are becoming too thin and too fragile. You cannot make a silk purse out of a sow’s ear. Can it be right to cut services such as early years and community education? Services that support the city’s children and young people, disabled people, the elderly and adult literacy programs are again being disproportionately reduced. Children and young people benefit greatly from the services that are offered including peer education and group work. Disabled people are able to attend groups during the day and this can be a vital link for them, the same applies to our elderly residents and to those who benefit from the adult literacy service. Over recent years we have seen a constant reduction in preventative services; surely prevention is better than cure. Our most vulnerable and disadvantaged children and families and other underprivileged groups are regularly experiencing the disappearance of the services that they need. How does this sit with the council pledges to give every child a good start in life and to reduce poverty, inequality and deprivation? Equality and gender Impact assessments are often carried out after decisions are made, rather than in advance to inform the decisions making process. There is a risk that the council are not fully meeting their Public Service Equality Duty. The most disadvantaged and most vulnerable tend not to be consulted at all. This leads to poor judgements leaving the least powerful and vulnerable individuals and communities being disproportionately disadvantaged. Trade union members and city residents have been encouraged by the council to participate in completing their Budget Calculator. This is a very cynical method to inform decision making. The returns are very low and some of those who complete the task may have little understanding of statutory services, the role and function of local government or may only have their own vested interests at heart. Saying this it is significant that 63% of budget responses supported increasing the council tax. Those who have a greater knowledge and understanding, and may oppose the cuts, have no capacity through this exercise to challenge the status quo. Management and elected representatives then use the returns to claim that their employees and the public decided what should be cut. This is a cynical negation of senior management and the elected member’s responsibilities. All services provided by the council will be vital to someone. Like a jigsaw all the pieces are needed to complete the picture. It is important to keep all these pieces together, if you give one to someone else, or a few pieces to a number of people, it will create difficulties when you want to put it back together and see the whole picture. If a piece of the puzzle is lost, or someone does not look after a piece, then the jigsaw becomes worthless and not fit for purpose. If you value the puzzle, look after and care for it and it will continue to work effectively. The scenario above applies the same to the council and the services it provides. If you believe that you can continue to reduce the services (make the pieces too small –they will not fit into the jigsaw) if you outsource service to vested interests, who’s main ambition will be profit for private gain and who employ staff on low pay and poor conditions, mistakes will happen. We oppose the introduction of a local authority trading company. In Edinburgh we have witnessed this with private care homes, and in England where many local authority services have been outsourced and failed with the result that they have had to be taken back into local authority control. The trade unions will resist, further cuts and any attempt to outsource services and further attacks on our members working terms and conditions. Closing special schools and secure units that provide invaluable support and protection to our most vulnerable children, young people and their families is irresponsible especially when there is no clear or detailed plan of how their needs will be met. There needs to be great caution when reducing the number of managers. Unlike the private sector, many managers will have clear and specific areas of responsibility that will carry a high level of professionalism and expertise applicable to specific service areas. The cuts to public services won’t work. Most spending cuts are a false economy – the redundancy costs and knock-on effects on employment, growth and tax revenue will make the situation worse. On average every redundancy creates £29,400 in additional costs to the public sector as well as undermining morale and productivity. Monies could be saved every year by reducing the agency bill. Reduce the number of private consultants who bring little discernible benefit. The Scottish government’s announcement that the council tax freeze will remain for another year may result in another 15000 job losses in the Local authorities this is on top of the 50,000 lost since the financial crash a truly is shameful situation. The cabinet secretary John Swinney is clearly out of touch with the situation affecting local government and the impact that this is having on our communities. The richest continue to gain while the most deprived and needy continue to suffer. I would call on the SNP representatives in this chamber to hold him to account and the capital coalition to take a stance. The silent slaughter of Local Government needs to stop. The freeze needs to be lifted. We should see the introduction of a tourist tax and supermarket tax. The finance raised by these needs to be reinvested into funding the services. There is also a need for the city council to look at a short, medium and long term strategy of debt management. The trade unions will continue to engage in meaningful dialogue with the administration and council officers. However, it will remain the case that we will not participate in a manner that encourages cuts to public services or undermines the terms and conditions of public service staff.